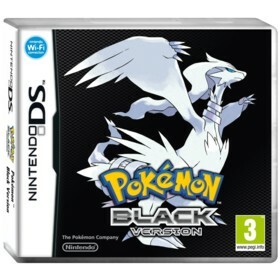 Pokemon Black is a Nintendo DS game in the RPG genre. The game was published by Nintendo and developed by Game Freak. The game has an ESRB Rating of E (Everyone 6+) and was released on 2011-03-06. The game's official site can be found at www.pokemonblackwhite.com. I picked up Pokemon Black at launch and have been playing it ever since. With the exception of the 150 or so new Pokemon and the online Dream World functionality, it's not very innovative. Of course, the graphics have once again received a slight upgrade over previous versions, but I found them to be more blocky and pixelated as well. The look of the pokemon themselves is more realistic which is sure to please/annoy some fans of the series (I personally liked the new look of the pokemon). The music and sound effects, on the other hand, has remained pretty much the same. I found this slightly disappointing as I know most of these tunes by heart and would of at least preferred remixed versions to keep things interesting. The game's story is more serious than the previous games. The main foes in this game, Team Plasma, are bent on freeing Pokemon from their human masters - claiming that humans hinder their growth and happiness. While I liked the original theme, I felt Game Freak could have done more with it. They should have given it more time and explored it further. As it stands, its almost like an afterthought. Like previous games in the series, Pokemon Black and Pokemon White have their differences. The story itself is identical, but each game has its own exclusive area. Pokemon Black has Black City where you can battle trainers every day and purchase rare items like Heart Scales and Pokemon White has White Forest where you can capture rare pokemon that are somewhat difficult to obtain normally. Also, as is typical, each version has about 20 unique pokemon (Pokemon White has many more than Black since all the pokemon in its forest are exclusives). But as always, you can obtain the other versions exclusives via trade. One little piece of advice I must give which sounds weird for a Pokemon game, but try to get through the game as fast as possible your first time through. The amount of time you take to clear the game affects how many people populate Black City/White Forest. If you take too long your city and forest could wind up being a wasteland by the time you visit. Sure, you can visit other people's city/forest and try to convince them to populate yours instead, but it is a much bigger hassle. Overall, I found this to be a very bad design decision - why would anyone want to rush through a pokemon game? They should have done the opposite - like slowly populating the forest and city the more you play the game. The Dream World functionality is pretty cool. You get to upload one of the pokemon from your game (by tucking it in to bed) and explore its "Dream" via the online Pokemon Global Link Website. The site itself is flash based and has very nice graphics and sound. There are many things you can do in the Dream World, such as planting berries, playing minigames (which, upon successful completion, result in you being able to transfer the pokemon you played with to your actual cartridge), decorating your house, visiting your friends house, etc.. The best part is that these "dream world pokemon" have special abilities that have never been made available in the past and they open up some interesting and unexpected battle possibilities. Once you are done exploring the Pokemon's dream you wake them up in your game and the pokemon appears in your game's "entralink". The "entralink" is basically the name for the local wi-fi feature of the game - you can also use it to visit the game world of your friends and perform things like co-op missions. A few other "firsts" for the series are the introduction of seasons (which slightly alter the type of pokemon that can be caught), two new battle types (triple battles and rotation battles), and finally the pokemon musical - which is a variant of the classic pokemon contests that have appeared in older entries. I know I've spent the majority of this review "complaining" about various aspects of Pokemon Black - but overall it is still Pokemon and it is still an excellent game. I've already put over 130 hours into the game and am still playing it today. All I can say is, if you are totally tired of the whole Pokemon phenomenon, then this game "might" make you interested again due it different art style, new pokemon, and more serious tone. If you still love pokemon, you're going to pick it up regardless of what I say :). Overall, this is another solid entry in the franchise. Hopefully they innovate more in future installments.